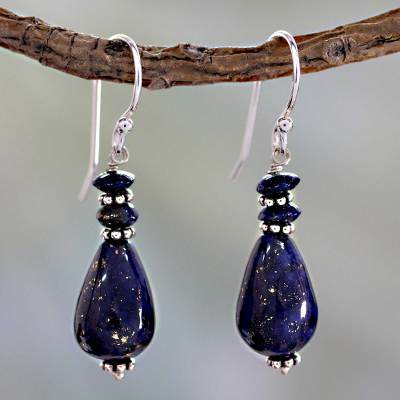 Fair Trade Sterling Silver and Lapis Lazuli Earrings, "Delhi Dusk"
The unique beauty of lapis lazuli, the birthstone of September, is captivating in earrings by Narayani highlights. Lapis is said to open all the chakra centers as long as there is love in the heart, comprehension in the mind, and wisdom in the soul. The earrings are crafted by hand with sterling silver. "I love my new earrings!" A great value and much prefer to support these artists than to buy mass produced costume jewelry! Thank you! I so agree with Karen's comment and much prefer the jewelry from Novica artisans than the mass produced stuff! The earrings are just lovely and will look so good with a lapis bracelet I have. I expected them to be a little larger but they are beautiful, none the less. Shipping is always quicker than I anticipate. "A perfect match to Novica bracelet"